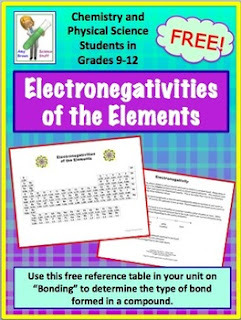 Electronegativities of the Elements: Free Reference Table for your chemistry or physical science students. When teaching my unit on Chemical Bonding, I give my students a copy of this reference table in order to have a quick and convenient way of looking up the electronegativity of an element. As you know, the electronegativity of an element is used to determine if a bond is nonpolar covalent, polar covalent or ionic. This is a 2-page free download. Page 1 has the periodic table showing the electronegativity of each element. Page 2 provides a brief explanation of electronegativity and the role it plays in bonding. Both Word document and pdf files are included.